Cicadas hold particular meaning for me. We hear them a lot more often than we see them, so I took the unusual opportunity for a photograph today. This one was lying dead on the bicycle path, somewhat the worse for wear. It has gouges on its head and thorax. One of my earliest memories involves a cicada. I am 3 or 4, running barefoot on stubby legs through the grass at Poplar Bluff where I grew up. Summer sunlight flashes on Lake Erie below the bluff. Suddenly I hear a loud noise overhead that stops me in my tracks. I look up at the sky. It’s an electric drone like a saw. It comes from the direction of some silver poplars and a hydro pole at the edge of our yard. With this memory, I associate the drone with the electric wires instead of the trees. It is a common sound at Poplar Bluff on hot days in July and August. For a few years I believe hydro lines buzz when heated by the summer sun. I found out about cicadas later. We had a big mulberry tree outside our door, loved by birds and cecropia moths. Our cats would climb like monkeys through the sprawling branches. It also attracted cicadas. I would find a few skins on the trunk every summer. Rarely I observed an adult emerge from the nymph skin and cling to the bark while its wings and body changed. From an insect field guide, I learned cicada nymphs live underground for years, sucking nutrition from tree roots. During warm summer weather they crawl up the trunk, break out of their skins and become adults for a few days to breed and restart the life cycle. Later I realized that noise from the sky on hot summer days wasn’t electrical wires but the song of male cicadas summoning their mates. 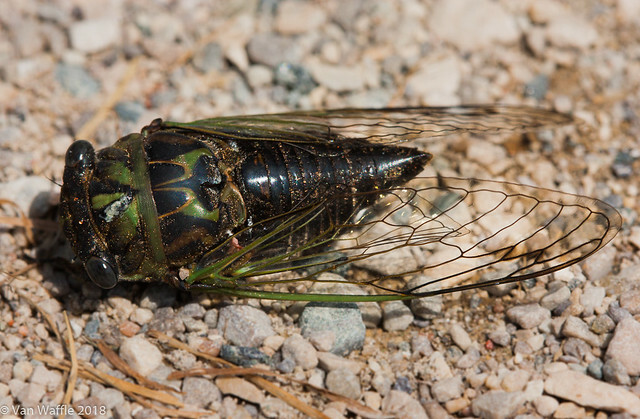 Cicadas are notorious in Eastern North America for swarms that emerge every 13 or 17 years depending on the species. However, this species is Neotibicen canicularis, the dog day cicada, so-named because it sings during the dog days of summer. The species name canicularis is a reference to Sirius, the dog star, part of the constellation Canis major, the greater dog. Greek and Roman astrology associated Sirius rising in summer with drought, lethargy and mad dogs. Nymphs of the genus Neotibicen spend only two to five years underground. The adults appear every summer, rather than in cycles. 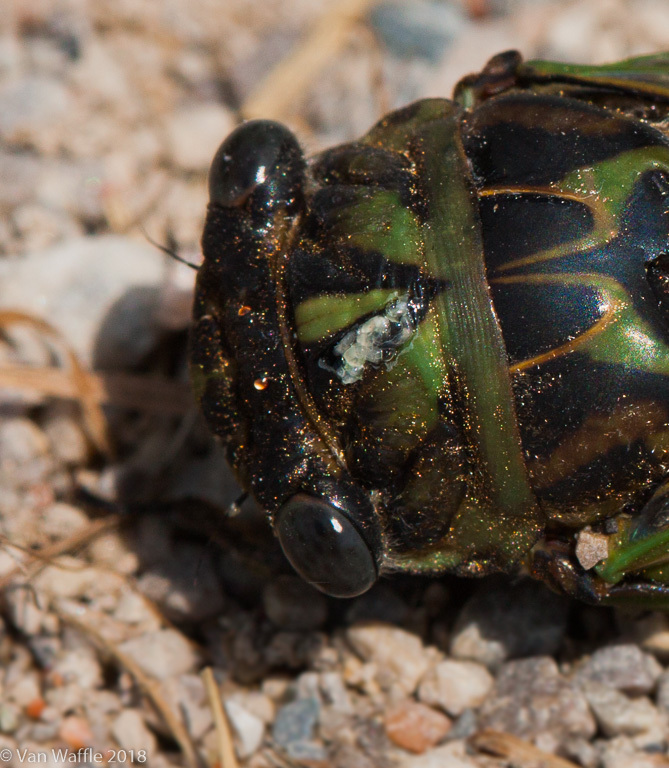 Cicadas have three simple eyes called ocelli between their large compound eyes. These are thought to detect light and movement. In the detail below they are visible as three amber spots forming a triangle. Through my office window I hear cicadas droning all day long in Twin Oaks Woods on hot summer days. They bring back that early memory of running barefoot, the simple joy of childhood, the awakening of curiosity, and a humbling reminder that mistaken beliefs can last a long time. Sometimes we get it wrong. Sometimes we need more information. Sometimes the natural explanation is more wonderful than what we think we know about the world.